Mobile is big, but just how big is it? Justine Jordan, Marketing Director, Litmus, posed that question during her Industry Perspective session, “Email Design: How to optimize for all environments in a mobile world,” at MarketingSherpa Email Summit 2014. 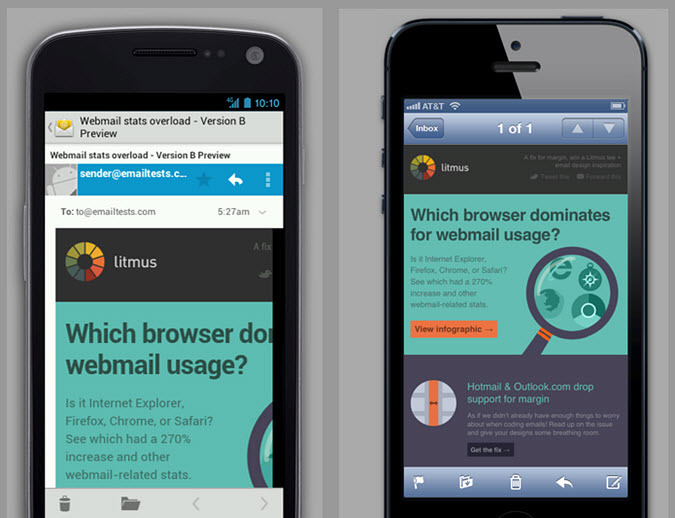 Almost half of all emails are opened on mobile devices, according to Litmus research. That’s definitely big – especially since it was just three years ago that Litmus found only 10% of emails were opened on mobile. So what can we do to capitalize on this drastic shift? Justine said we need to re-examine the subscriber experience from the mobile user’s perspective. While she covered the whole path, we’ll hit on four of the steps subscribers experience. Many inboxes are formatted so that users can see not only the subject line, but also a line of additional text in the email. This text is pulled from the first bit of text at the top of your email. However, you can hide this text and still have it show in the pre-header area if you wish. “My challenge to you is, is this a positive brand experience? Is this really what you want people to associate with your ‘From’ name and subject line? Go back and re-evaluate your pre-header text – it’s showing up in mobile inboxes everywhere,” Justine advised. 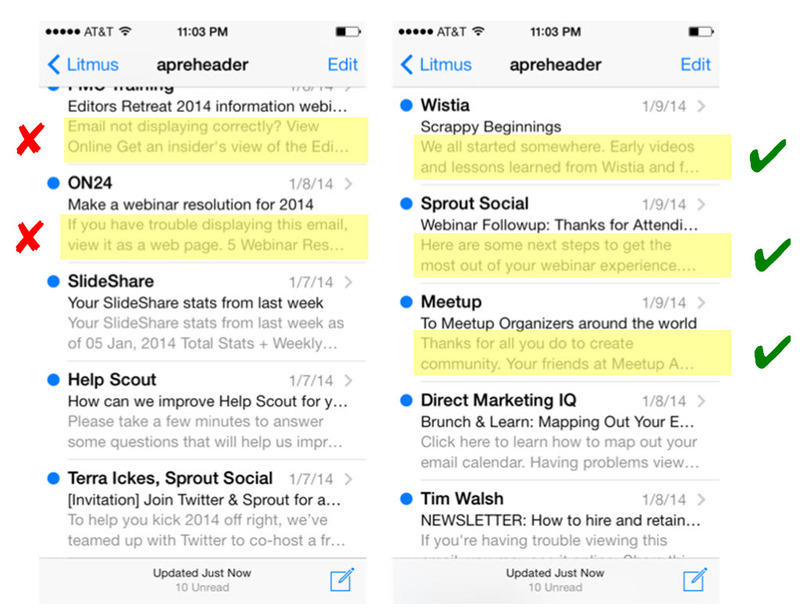 The pre-header is another opportunity to infuse value into your email – don’t let it go to waste. iPhones cut your subject lines off at about 35 characters. This is the same email but it looks completely different. Why? “It’s because not every smartphone or mobile device is going to support HTML and CSS or even display the email in similar way,” Justine said. Plus, Android devices vary in what they do and don’t support, so they can be challenging to work with. Some scale the email, some cut off the right side of an email and some support responsive design. Justine said iPhones are a little friendlier, scaling to a 320-pixel width. But with scaling comes other issues to keep in mind: text and images resize as well. Justine hit on another key aspect of the user’s experience after opening an email on your email: scrolling. In an email like the one to the right, you don’t know where you’ll be tapping. Where will your finger land with so many small choices? You need to make the user experience more friendly in emails. You don’t need to compact as many options as possible “above the fold.” There is no fold on your iPhone. “Embrace the scroll; people are inherently going to scroll on mobile devices,” Justine said. On mobile devices, people are not clicking. Instead, they’re tapping, rendering your “Click Here” call-to-action illogical. There is no mouse to click on a smartphone – only a finger, or stylus, to tap. 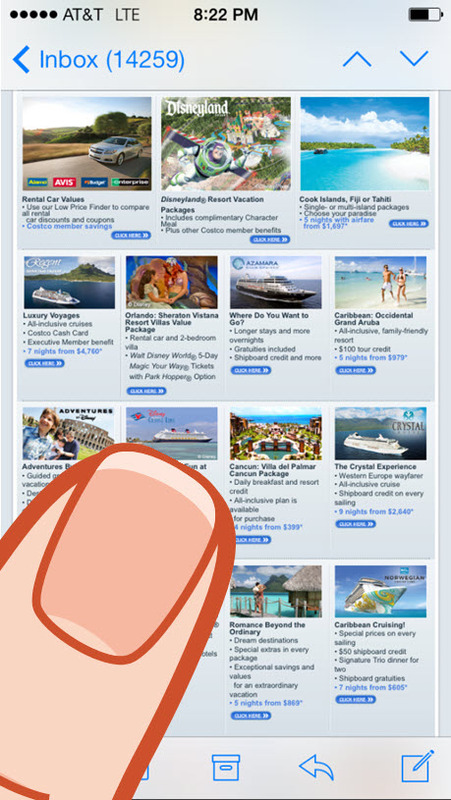 “’Click Here’ is a really crappy call-to-action anyway. You need to add a lot value, make sure the buttons are topical, and tell people what they’re going to get when they click or tap on your emails,” Justine said. 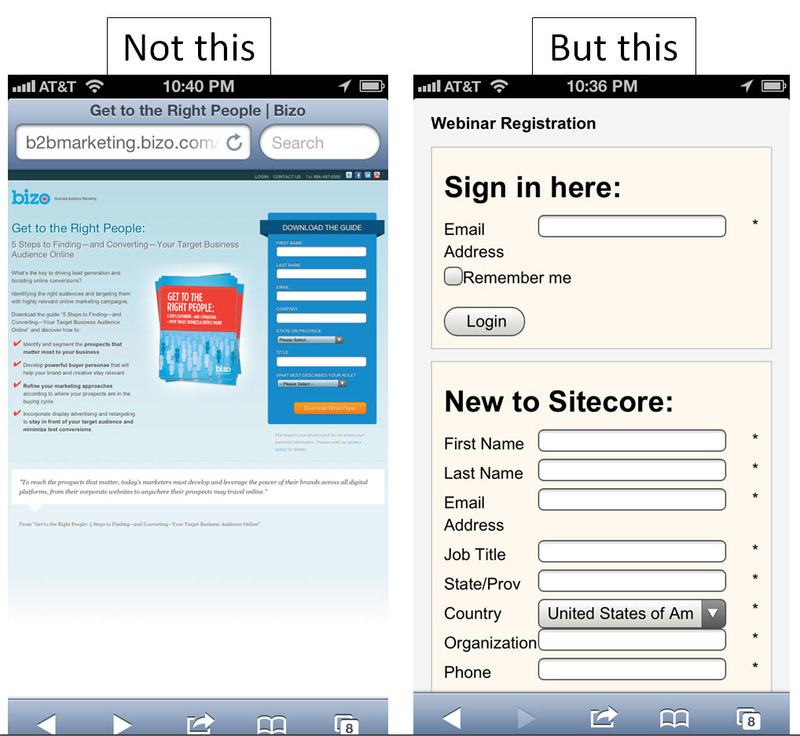 The “tap” experience is more than the text of your buttons and calls-to-action. It’s also about the area or location you want to physically tap. A finger requires more tapping space than a mouse needs clicking space. Make sure they can actually tap on that valuable CTA you crafted. Do your best to sync those two worlds together. That means your landing page should allow people to convert – literally. On this Victoria’s Secret page, Justine could not buy the item in her cart. She could not get the pop-up to disappear no matter how many times she tapped the “X” or zoomed in on the box. With the pop-up fixed on the page, she could not finish her purchase. For B2B companies, make sure people can read and fill out your forms. “Make it easy. Don’t create more friction than you have to,” Justine advised. After all, you successfully moved subscribers past the first five steps to conversion – you don’t want to fail here in the final step. 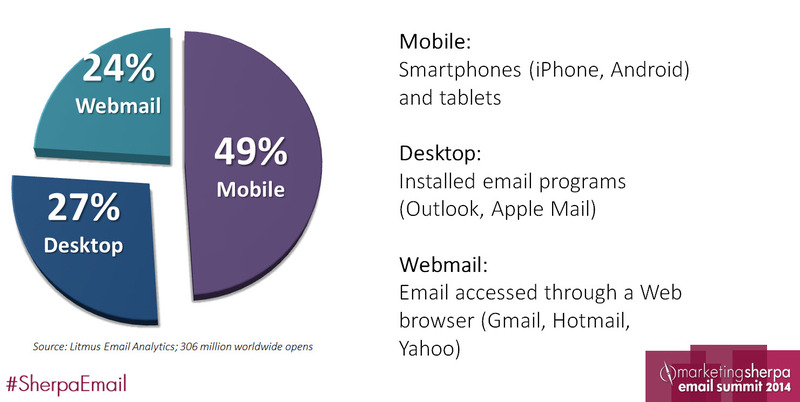 Interested in learning more about mobile email marketing? Watch Justine speak on the Responsive Design Panel at MarketingSherpa Email Summit 2014 in this free on-demand video replay.